It has the capacity to revolutionize the generally accepted model of higher education along with the entire way students learn. It could be one of the most significant advances in teaching since the blackboard, yet few fully understand it and even fewer know how they might apply it. A popular conversation in higher education is in the opportunities provided by Open Educational Resources (OER) and the prospect for educators and students to access open educational learning materials, open licensing and open sourcing to support classroom learning. But if OER is such a game changer, why hasn’t its adoption been central to every classroom and every campus? 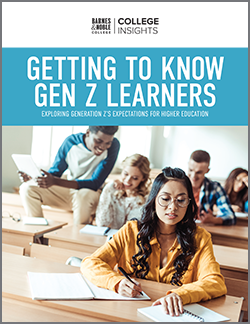 Despite becoming a favorite buzzword, the actual adoption of OER has been slow, which Nicole Guerrieri, Barnes & Noble College’s Director, Digital Education, explains this way. “When we first started to talk about OER several years ago, we found there was strong interest from faculty in its potential — and we thought its use would quickly become widespread.” Yet Guerrieri explains that the adoption of OER has actually been more deliberate than anyone could have predicted and, with few faculty actually having first-hand knowledge or experience with open resource materials, there was a significant information gap existing on how it might be applied in the classroom. A national survey of 2,000 faculty members conducted by Babson Survey Group and University of California-San Francisco researcher Elaine Allen, found that 65.9 percent of faculty are unaware of open educational resources. The survey also found confusion around what exactly qualifies as OER, apprehension about accessibility, and specific concerns about rights management and just how ‘free’ open content might be. Because of those kinds of anxieties, Guerrieri believes that Barnes & Noble College’s solution is well-timed. “Our response comes from our commitment to continually look at ‘what’s next’ for our faculty and our campus partners,” she says, acknowledging the support the company can bring to faculty and students in their partnership with XanEdu, Inc., and the ability to deliver OER content in the form of course packs, custom textbooks and lab manuals. All of which comes at a time when the arguments for OER have become compelling. With tuition costs on the rise and government funding experiencing cuts, OER represents an increasingly attractive cost-saving addition to learning support and provides educators with the opportunity to control costs while also providing more customized content to meet and improve learning objectives. Offering a wealth of mixed-media content, including videos, audio clips and traditional text, OER can provide greater access, flexibility and a deeper dive into the subject matter for both on-campus students and those going back to school for retraining. 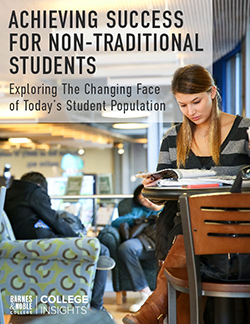 Traditional textbooks can be supported by a wealth of ancillary customized information, and faculty can create their own course work that will more accurately reflect the individual strengths and nuances of their courses. Barnes & Noble College’s Guerrieri has been presenting her customers with the potential of OER through stronger faculty communications and consistent outreach to faculty and educators, and is beginning to see more substantial and informed interest in OER adoption. 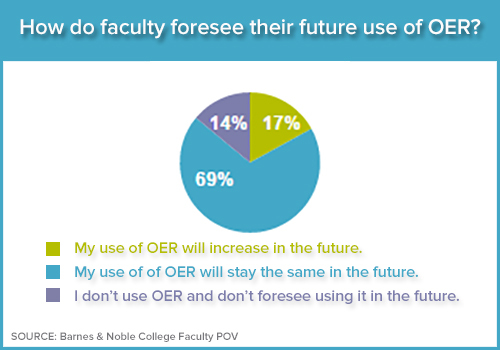 According to a recent Barnes & Noble College survey of faculty, 86 percent of respondents said they thought their use of OER will either stay the same or will increase in the future. OER, it is argued, can not only help support access to a higher quality education, but can also be a platform to the idea of limitless access and shared knowledge. And, at its fullest potential, the opportunities for open content and sharing are limitless.